Well known for excellence in songwriting, singing, musical artistry, originality and high energy performances, The Rick Strickland Band captivates audiences of all ages with feel good music that speaks to the heart. In fact, their most loyal fans say the reason they love RSB is because the music & the band members are "real." New fans quickly fall in love with the realness and ability to touch emotions through their music. And not only are they talented artists, they are FUN to be around and are masters at engaging their audiences during their shows! You can't help but dance, sing, laugh, cry, be thrilled, be surprised, and all emotions in between with these wonderful hard working artists hit the stage! The heartbeat of RSB features the awarding winning music and showmanship of Myrtle Beach based singers, songwriters, & entertainers Rick Strickland and Lesa Hudson and their arsenal of #1 beach & shag music radio hits including: Something Smooth, So Do I, One Step Closer, She Can’t Fix Grits, Party Til The Break Of Dawn, Bubba White, and more recent hits Every Now And Then, I’m Hungover, When You Look At Me, Amazingly Amazing, Get Your Feet On The Floor and Rick's latest hit, New Beginning! But RSB is far from the typical "beach band." Their impressive original song playlist covers the gamut in musical styles including Classic R&B Soul, Classic Rock, old school Funk, and a splash of Country, guaranteed to please audiences of all preferences! Their unique styles, passion for music and winning personalities sets them apart from the rest. Renowned DJ & Beach Music Authority John Hook once introduced Rick & Lesa as "the Prince & Princess of their own brand of beach music" - a title they wear proudly. Rick & Lesa are recipients of 8 Carolina Beach Music Awards (CBMA) and have been recognized with over 60 CBMA nominations for their musical contributions to the music industry. Additionally, Lesa is a 4 time nominee in the Inspirational Country Awards held annually in Nashville TN. 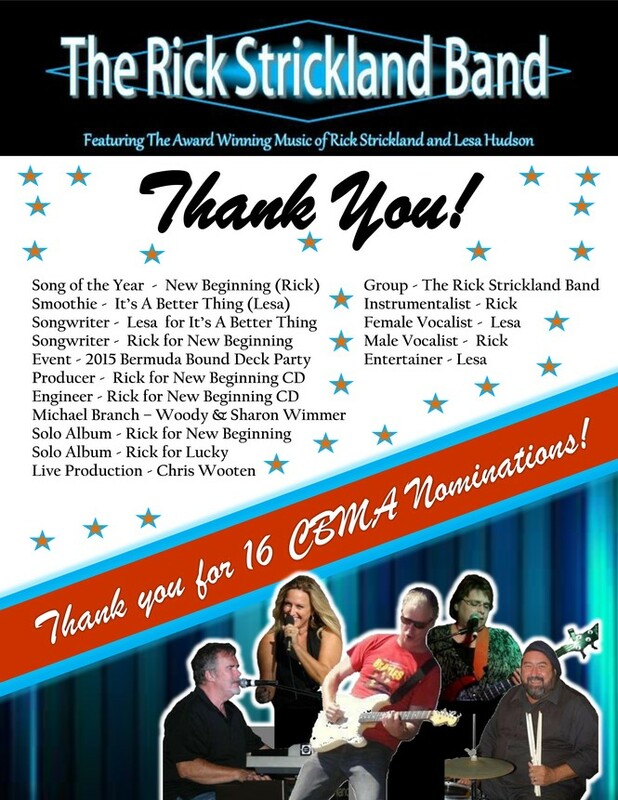 The Rick Strickland Band is revered as one of the top bands in the industry and is proudly distinguished as the only band in the market to successfully compose, produce and perform 100% of their own original music. The band boasts an impressive collective resume having performed with international recording acts including Billy Joe Royal, The Drifters, Joe South, The Shirelles and Ray Stevens, and have performed at some of the nation’s most legendary venues. RSB’s musicianship and vocals are stunning, the music & lyrics touch the soul and are fun to sing and dance to, and the energy and professionalism are always over the top when the Rick Strickland Band takes the stage! When you book The Rick Strickland Band, you invest in seasoned professionals who are serious about their musical artistry, who are serious about entertaining the audiences who attend their shows, and who will provide a top quality, high energy musical experience that no other band in the market can provide.